Can't say the same for my other hobby. Glad I took the plunge. Good guess but no, other hobby is 1/10 scale rc rock crawlers and on-road cars. Lots of drama/know it all's, at least on the facebook pages and forums. Granted I have a few guys I run with and we have fun. 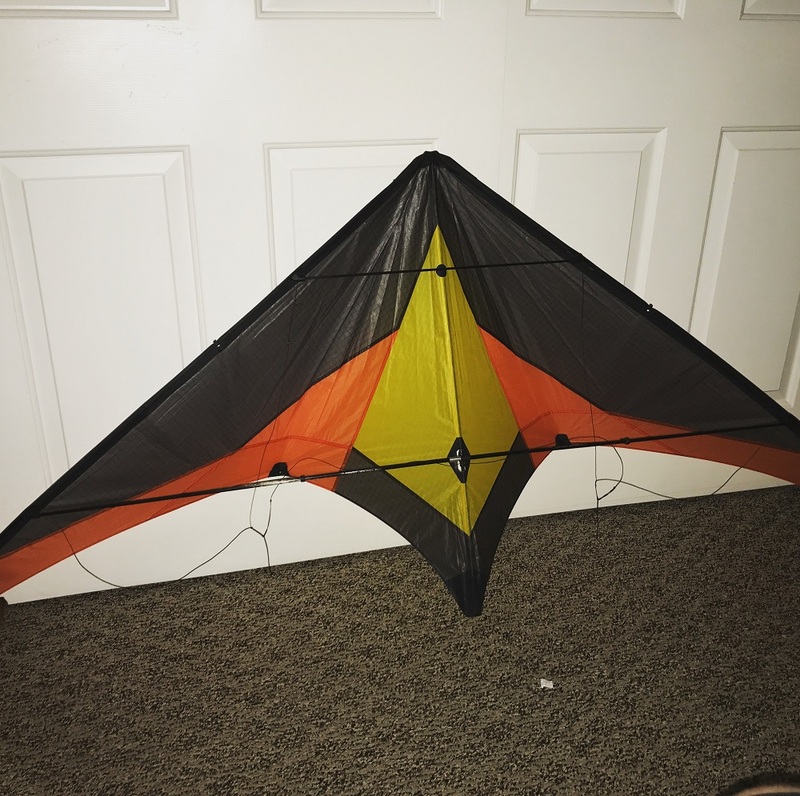 Well last night my kite arrived in great shape and just as advertised by the seller! Took me about an hour to figure out how to put the darn thing together. Tonight I made a proper fool out of myself at the local part right at sunset. Tried flying the kite in literally zero wind (I did try the whole "milking the wind" technique)... was able to launch nicely but couldn't keep it in the air to save my life. I'm caulking it up to lack of experience and my 65' flight lines. Watch a video of people flying a Aura SUL inside and no wind with less effort than I was trying to exert at the park, figured the users had about 12'-20' of line. Decided since I had more line sets coming I would cut a 16' section out of my 65' lines to make a ~16' set, to mimic their setups. I am planning to cut the rest of it down to make other smaller sets such as a ~30' and ~10 foot, etc. once I get my new 50', 75', and the 100' set (100' graciously gifted to me by another forum member). 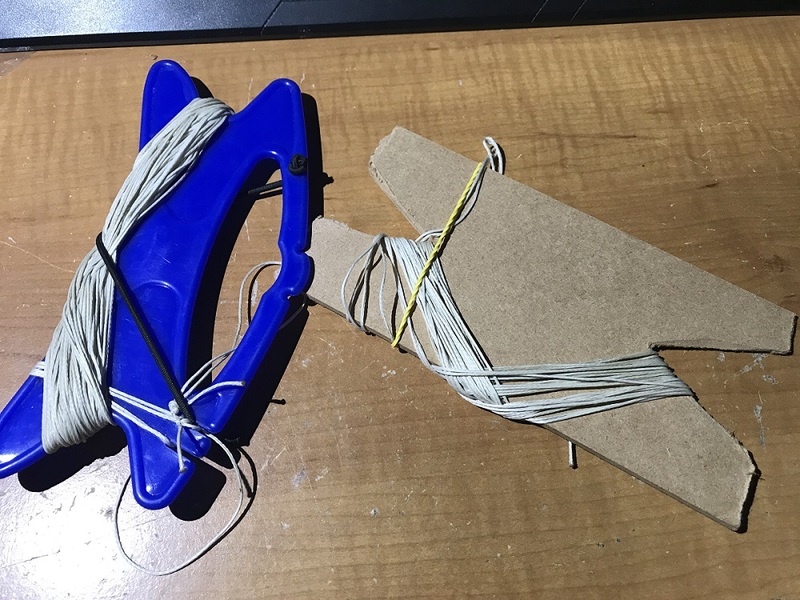 Please excuse my hastily made winder, planning to get a few extra proper ones when I order a kite bag later this week. I never figured out how to fly in absolutely zero wind and I've been flying a long time (just not regularly like some of the members here.) I figure if I can feel the breeze on the back of my neck I'm good to go. If it's too light and not there at all I don't even try. I have a Nirvana WW (SUL) that still needs some wind to fly. Somebody with more skills might be able to fly it but I haven't put the time into getting to that point and I'm okay with that. The bottom line is to go out there, have a good time doing it, and don't let yourself get frustrated. Thanks for the reply! Yea flying in no wind isn't easy and I am not expecting it to be. I am quite stubborn and willing to learn so I am going to keep at it, emulate what I see and read. I also look at it as a great source of exercise that I desperately need. Plus, little-no wind is common where I am at, so I really want to learn how to fly in those conditions. WindFinder will say 5MPH and will really be like 0-1MPH where I am flying due to the hills, valleys, and trees in my area. I'm the type that sees someone do something I like and I think to myself "I can do that!". Yeah I have a feeling I will be investing in a Prism 4D or another no wind kite like you listed soon. I by no way regret my buying decision as it was such a good price for what was upwards of a 300 dollar kite. Ironically I was going to purchase a 4D until this deal on the SUL came along. I tired again tonight with 16' lines and it went much better. Still not where I want to be, it will take practice though. Trying to get to the point where these two guy's were with their skyburner Aura kites (indoor one is the SUL and the outdoor one is the UL). I really can't get it to whip around like he does in the first video. Keep in mind, Devin (they guy flying in the indoor video) has been doing this for many years (started as a kid) and is at a skill level that very few people get to even after many years. Couple of things about zero wind flying. Outdoors, it is rarely actual zero wind, still air like indoors. With kites this light, any bit of air movement is working against you and makes park flying (even when it feels like dead calm) way harder. So, separate Indoor flying from Outdoor "Zero wind" flying. The two are often quite different. Learning the skills to keep the kite in the air and under control with just your body movements is WAY easier indoors because you are not competing with any air movement (unless someone forgot to turn off the ventilation system!). The best thing to try with a light kite and short lines outdoors is start at one end of the field and launch and just fly side to side and loops while walking backwards. No tricks, tight lines, hands together the whole time. Faster you move, faster the kite goes. Slow you movement until the kite won't fly. This kind of thing gets you a feel for how much (or how little) tension on the lines is needed to keep it moving through the air. From there, you can walk (or trot, or run) a 360. just fly to the left (or right) and keep going, backing up as needed to keep the kite flying in a straight line in a big circle. Thanks for the advice guys! I definitely need to work on the basics more, I got a head of myself on Saturday. Guess I set my sights pretty high to begin with... slow steps! While my Aura is out of commission my Prism 4D should be arriving Tuesday, next Saturday is looking like a good low wind day. Also there are a good amount of parks by my work so I am going to try and get out during lunch since day light is against me this point in the year. After Saturday's mishap I will have to remember to keep my Sky Dogs little wing (tough little bugger) with me for when the wind picks up too. Like I said though, while I did come home with a damaged kite this weekend, it was sure a lot of fun! Another thing, whenever I hear "park" I think "crappy wind". Just based on a lot of experience. "Parks" often have trees, and are near buildings, and even have fences. All these things, and the fact of just being in an otherwise developed area can make your average park a terrible place to fly. One of my favorite flyers once told a story about frustrations getting started that was something like: "I knew there was plenty of wind because all the trees around the park had moving branches, but the wind always seemed to be in a different place than my kite"
So, look to understand the direction of the prevailing wind in the area (where the wind comes from on normal, non storm, days) and then look for a flying field with no upwind obstructions for at LEAST 100 yards from where your kite will be. Where I lived when I started flying, the wind was from the North on normal days and from the south when storms were coming. I had a park for normal days and one for storm days. Lots more can be said about wind quality and how to figure it out. but it's pretty important.